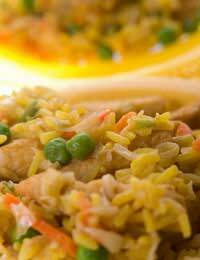 Savoury rice is a tasty alternative to vegetables or potatoes when servicing a family meal. Yes you can purchase ready prepared packets with dried ingredients but do you want to serve reconstituted food to your family that is full of additives? Why not try making your own version of this tasty meal – you can even freeze this and microwave for future use. There are many types of rice from the quick cook type, the short grain white for puddings and long grain white for curries and savoury recipes. Wild rice, brown rice, wholegrain rice are also becoming more popular as people become more adventurous with their food. For savoury rice cook whichever variety your family prefer although the long grain white or a wild rice are recommended for savoury rice meals. It is possible to serve savoury rice as a complete meal as you can add vegetables and various meats or fish to suit your taste. Here are a few savoury rice ideas, why not try and make some of your own? Heat the oil and add the onion. Cook until soft before adding the vegetables, tumeric and garlic. Cook for three minutes before adding the rice, stock cube and the boiling water. Simmer until the rice is cooked checking that the water does not boil away and the ingredients do not stick to the bottom of the pan. Serve immediately or leave to get cold and freeze in portions. Note: You may need to add more water or less depending on the type of rice used and the amount of vegetables. If you are not used to tumeric try a little to begin with. Tumeric is used for colour as well as its flavour. As above but replace the beans, peas and pepper with chopped cooked chicken with the sweet corn. Also use a chicken stock cube instead of the vegetable one. If using fresh chicken cut this into small pieces and cook with the onion. Try adding curry powder of chilli powder after the onion has softened to make a spicier version of this popular dish. Another version is the special fried rice. First fry onion, finely chopped vegetables and diced ham. Add a pinch of five spice or any other oriental spice to flavour. Boil the white rice separately in a meat stock cube and drain and set aside. Add the cooked rice to the meat and vegetable mixture and a tablespoon of butter. Mix thoroughly on the heat and serve immediately. Try to keep the vegetables slightly crispy so that they don’t turn into a mush in the rice. Any type of vegetable is suitable for these recipes including broccoli, cauliflower, courgette or mushroom. This is a good way to use up meat left over from a roast dinner. am interested to learn more of it, but this i we prepare in my house following the direction on it.